Nothing says American food like burgers and fries! It is estimated that Americans eat 14 billion burgers every year! Sorry cows! It is also estimated that the average american consumes about 29 pounds of french fries each year. The question always arises, where’s the best burger joint? Sure there’s tons of fast food burger places like McDonalds, Burger King, Wendys, & White Castle, but I’m talking about real burgers here. I’m sure you’ve heard of the huge burger chain “Five Guys.” They are everywhere these days and always get great reviews for having a great burger and freshly cut fries with the skins still on them that actually tastes like potatoes. If you live in New York or Miami you may have heard of another great burger joint that gets great reviews also called Shake Shack. I love to compare places to see which tastes better. So the question always rises between my friends and I, Five Guys or Shake Shack? My friends and I got into a conversation one day about burgers and Five Guys came up. I said that I’ve had Five Guys in the past and thought it was okay, nothing too special to have me wanting to go back. So my friend told me about a brand new place on Lincoln Road in South Beach that opened up called “Shake Shack” and he said that it was amazing. So after hearing all of the hype, we decided to make a Sunday trip to South Beach to give Shake Shack a try. I was hooked right away! I thought the food tasted amazing and the atmosphere was very cool. I went back to Shake Shack several times because it was so good. However, after awhile the question came up again, Five Guys or Shake Shack? So I decided to revisit Five Guys after awhile of going to Shake Shack. So I’m going to give you my opinion! Let’s break it down! Atmosphere: I think its cool that Five Guys has that neighborhood burger place feel where they scream out your order number, and how they keep it simple with the red and white checkered design. However, I think I’m going to have to give this one to Shake Shack. I think Shake Shacks atmosphere is cooler. The design of Shake Shack is very modern looking. I also like how they have rock music playing through the speakers and the design of the tables are cool too. Price: When it comes down to price, I believe they are both about equal. Both places will run you between $9.00 – $12.00 for a burger, fries, and a drink. Location: I love that Shake Shack is in South Beach on Lincoln Road. I think that’s a great location and makes for an amazing Shake Shack Sunday adventure. They also have them all across New York City including in CitiField. However, I have to give this one to Five Guys for right now because they are everywhere. Five Guys has 670 locations currently. Shake Shack has 7 locations currently. I don’t doubt that Shake Shack will one day be as big as Five Guys but they are still new. Food: Five Guys is known for their huge greasy burgers with tons of toppings to choose from and their brown paper bag of fries. To be honest though, I wasn’t that impressed. 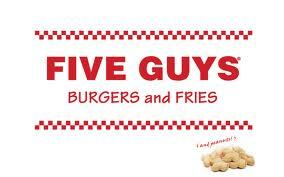 Everyone likes a greasy burger but in my opinion Five Guys is a greasy sloppy burnt burger that falls apart. I do think that there fries taste like real potatoes and I like that they are freshly cut with the skins still on them but the last two times I had them they were kinda soft. I like crispy fries. Shake Shacks burgers on the other hand taste amazing. I don’t know what it is about their burgers but they taste so good. My guess is, it’s a combo of the quality of meat they use and the right amount of seasoning. They never taste burnt. I think the bun tastes way better at Shake Shack too. They may not have as much toppings as Five Guys but they still have a decent amount. I also think that the fries are awesome at Shake Shack. They are crinkle cut and always fried golden brown to perfection. I have never had a bad fry there. To top it off Shake Shack also has amazing shakes and custards which they call “concretes.” The “Key Lime Pie Oh My” is incredible and so is the “Black & White” shake. Conclusion: In my opinion, Shake Shack is the winner here! I’m not saying Five Guys is horrible, but I am saying that I think overall Shake Shack is much better. Five Guys is good if you got that burger craving because they are usually close by. However, if you have time to go to Shake Shack, it’s well worth it! If you haven’t tried it, give it a try, I promise you won’t be disappointed! I’d love to hear your feedback on this topic also! What do you think, Five Guys or Shake Shack?